Since I’ve been promoting alcohol, all types of it, I think it’s only fair that I help with the morning after as well. 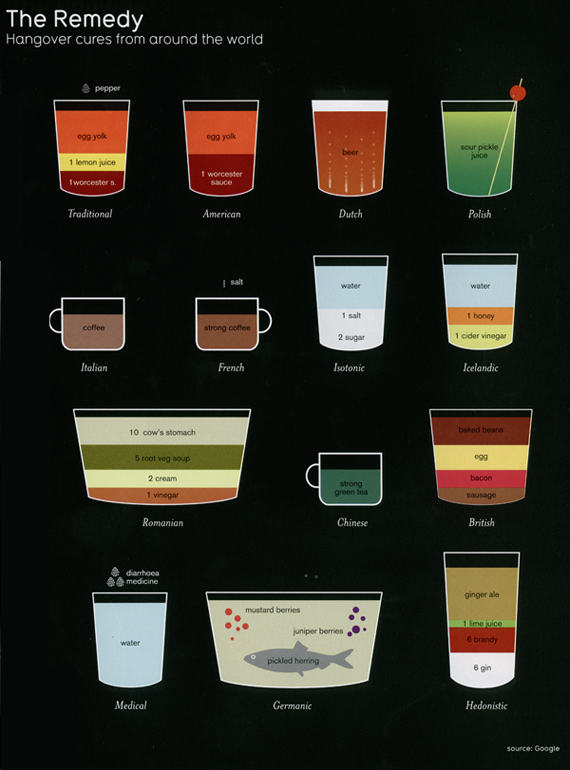 And look what I found… Hangover remedies from around the world. Personally the Dutch seem to have the best cure and the Romanian sounds awful. Which one would you pick? And do you have any remedies you subscribe to? My personal hangover cure involves coffee, ibuprofen, orange juice, a banana, some yogurt, and maybe some toast and marmalade. I also find that a greasy breakfast type meal is best just after drinking. It may not keep you from avoiding a hangover, but it’s just sooooo good to pass up! Love the site! And the Sinatra quote is priceless! Thanks for sharing that G-Lo and I’m really glad you like the site 🙂 I’m still in the process of shaping it into what I want it to be. And your blog is a great chronicle of all things alcoholic! Soooo much great information! I’l be sure to promote it. Ahhh… thanks Karina! I’ll be sure to stop back often as well. Zane Furtado’s Remedy: 500ml Water with a pinch of Salt and a Greasy Beef Burger to get those proteins back where they belong!!!! ← Green vs Brown – Which would you choose?